located on ADF bases around Australia. As a not-for-profit Defence organisation, any additional funds made goes back to Defence and our customers through disbursements, price cuts and facility improvements. We’ve put together a number of perks and promotions, which will help you relax, save money and enjoy a little downtime! Being part of Defence, we put loyalty on a pedestal. We proudly support those who support us! We source and produce the very best quality food and beverages available! Our menus are designed especially for you and deliver on quality – convenience and value! We cater for all types of events held on base. No minimum order and free delivery! Keep up-to-date on the latest meal deals and promotions! Meet our AAFCANS board members and Governance team. Our Purpose, Vision, Mission and Values. View AAFCANS’ compliance information online. View our current corporate governance documents online such as our annual report, corporate plan, policies and more! Archive links are also provided. Looking to get in touch with AAFCANS? Contact us online or call any of our locations. Care to share feedback on your experience? Join our team and work alongside our ADF. View available positions online, get in touch with our ‘People Team’ or upload your Resume. and has been supporting our soldiers and airmen/airwomen since its inception in 1915. 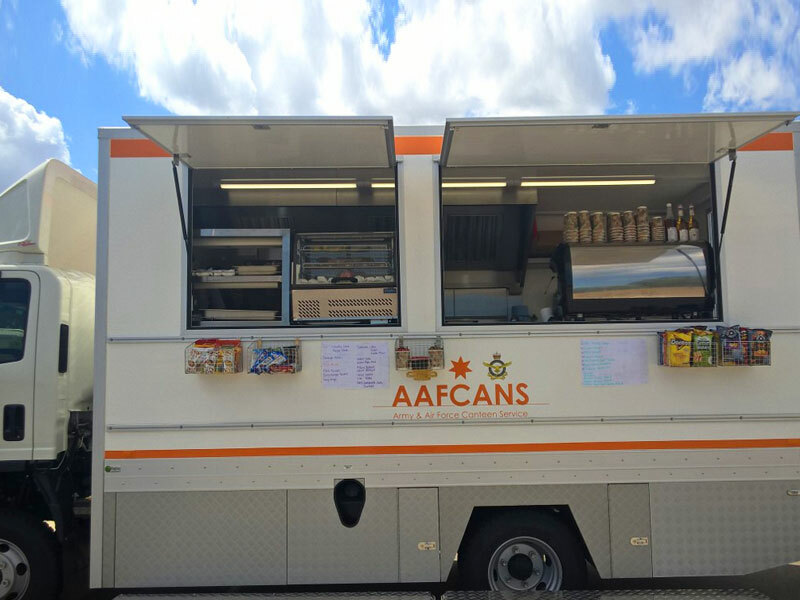 Gallipoli Barracks hosts the trial for AAFCANS new concept mobile food van. The new design features self-service barrista style coffee on-board. 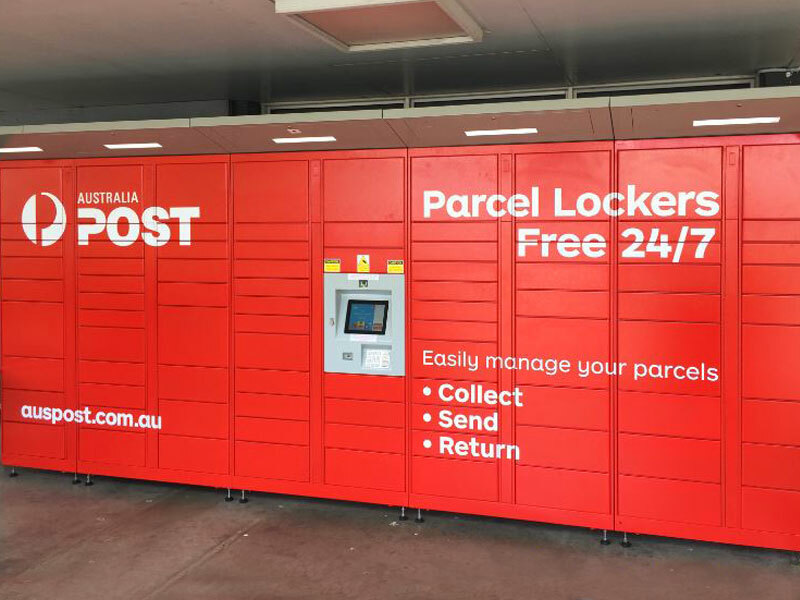 AAFCANS Aust Post 24/7 parcel lockers are now available at Gallipoli Barracks. Customers can sign-up to the the 'My Post APP' to click and collect on base. 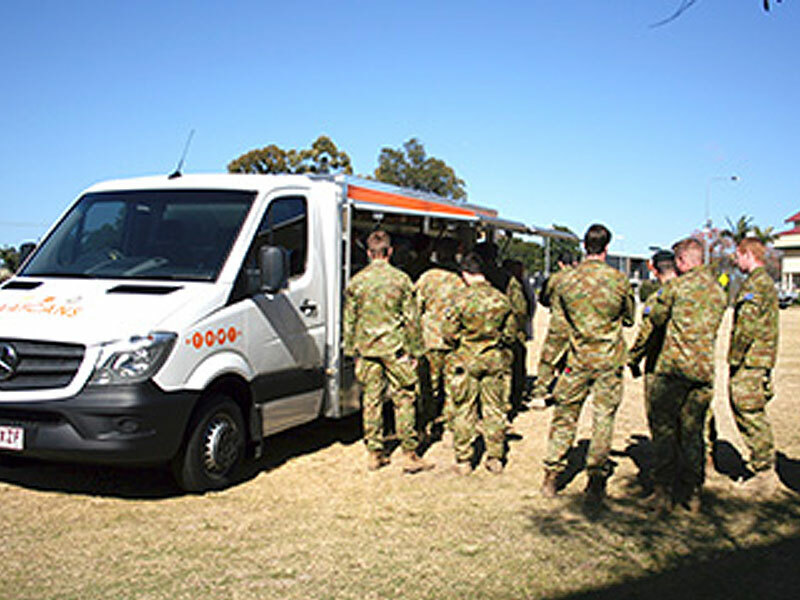 AAFCANS new all-terrain mobile amenities truck has arrived at Lavarack Barracks for the trial. The working trial will help to get the facility exercise ready. airmen/airwomen on base and on military exercises/deployments since 1915. 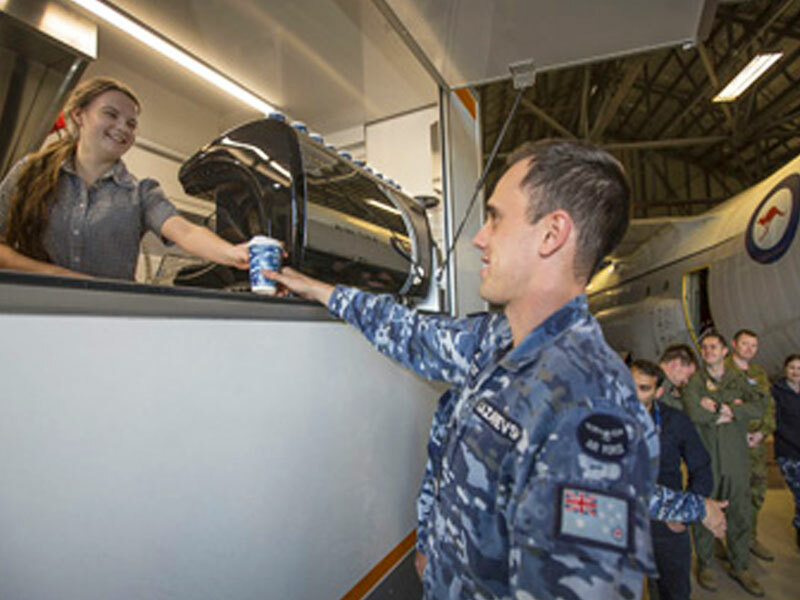 We operate diverse network of food services across 30 Army and Air Force bases and join ADF facilities throughout Australia. The facilities are specifically designed to meet the needs of our soldiers, airmen/airwomen and base residents. Our food service footprint includes: canteens, kiosks/small pop-up retail outlets, a tavern and bistro. Our network of mobile amenities includes a fleet of food vans - some with the capabilities of serving barista-style coffee in-board, all-terrain mobile amenities kiosks that can cook and refresh the offer on the move along with a range of coffee carts, retail pods and container kiosks. Where you go - we go! AAFCANS has the capability to deploy alongside our troops and support military exercises with mobile and field amenities. AAFCANS also offers customers additional services on base such as: barbers, hairdressers, post offices, mechanical workshops, clothing retailers, dry cleaners, photographers and banks. These are provided on our behalf by our licensed agents. When members spend their money at an AAFCANS branded vending machine they are contributing money back directly to their base's welfare. 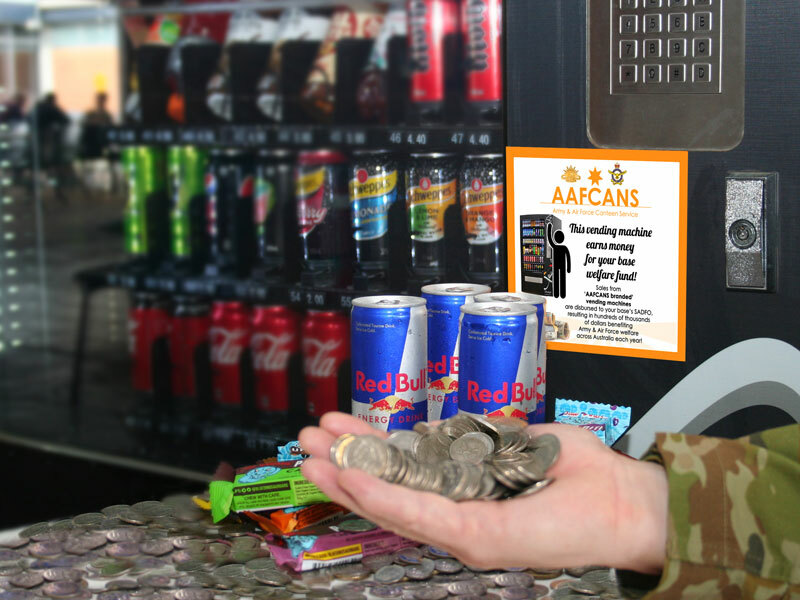 AAFCANS disburses profits from its automated retail vending program to Defence welfare funds - on the bases where the profits were generated. See 'Giving Back' for the latest welfare disbursements. 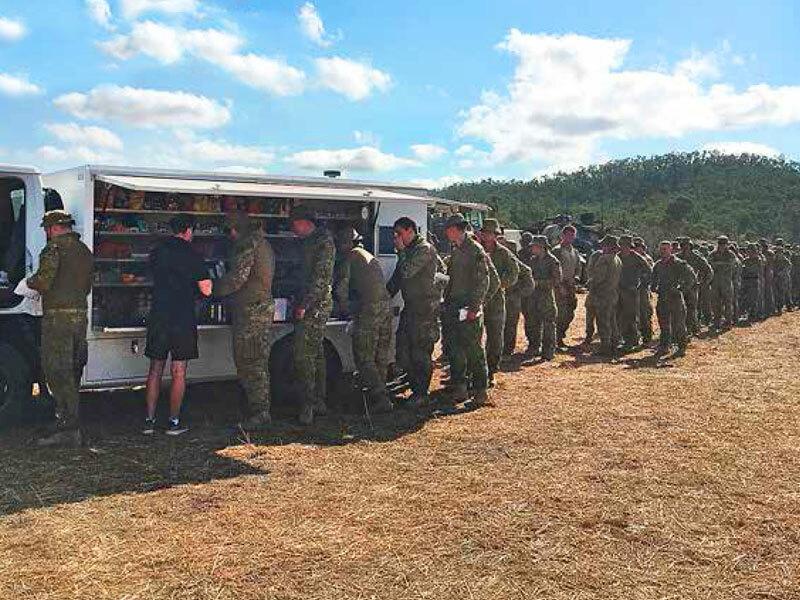 AAFCANS is a not-for-profit organisation, our core purpose is to provide Defence members with convenient access to quality food, beverage and retail items and support base welfare. Any excess funds are disbursed into outlet facility improvements, services and improvements to benefit our Defence force personally and base community.